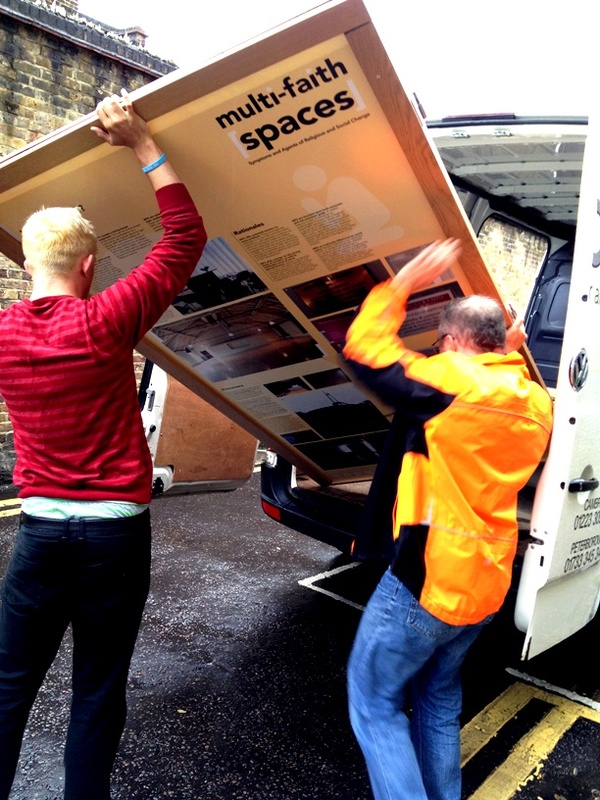 The University of Manchester’s exhibition has arrived in London! Tuesday’s opening event will be packed – the guest list is extensive and includes people from faith forums across London as well as professionals from the NHS, universities, prisons, DCLG, local councils – and designers of prayer rooms and quiet rooms. We will be meeting a wide range of practitioners. If you haven’t let me know you are joining us, please do so asap. The exhibition arrived on Sunday after showing at three venues in Cambridge. The researchers at the Universities of Manchester and Liverpool are interested to hear our views and responses. The workshops and opening event will be recorded, but contributions to the workshops (see below) will not be attributed without permission. Dr Chris Hewson (Manchester University) will be speaking at the opening event on Tuesday 10th July at 12.30pm – and participating in the workshop at 2.30pm that day. Monday – prisons, police stations, secure mental health units; Tuesday – Higher & Further Education; Wednesday – NHS settings; Friday – airports and shopping centres. Please book in advance. Download the flyer here and pass it on to people who may be interested – the exhibition and workshops are free of charge, but only with us for one week.